In bridge, the bidding often designates a suit as the trump suit. If the final contract has a suit associated with it — 4♠, 3♥, 2♦, or even 1♣, for example — that suit becomes the trump suit for the entire hand. 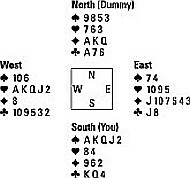 Often, in bridge books, a single card like the four of spades is written ♠4 because it saves space. Similarly, a bid made by any player, such as four spades, is written 4♠ (notice the difference). A final contract is written the same way as a bid, so a contract of three diamonds usually appears as 3♦. When a suit becomes the trump suit, any card in that trump suit potentially has special powers; any card in the trump suit can win a trick over any card of another suit. For example, suppose that spades is the trump suit and West leads with the ♥A. You can still win the trick with the ♠2 if you have no hearts in your hand. Because trump suits have so much power, naturally everyone at the table wants to have a say in determining the trump suit. Because bridge is a partnership game, your partnership determines which suit is the best trump suit for your side or whether there shouldn’t be a trump suit at all. You can easily see the advantage of playing with a trump suit. When the bidding designates a trump suit, you may well be in a position to neutralize your opponents’ long, strong suits quite easily. After either you or your partner is void (has no cards left) in the suit that your opponents lead, you can play any of your cards in the trump suit and take the trick. This little maneuver is called trumping your opponents’ trick (which your opponents really hate). Your lowly deuce of trumps beats even an ace in another suit. In contrast, if you play a hand at a notrump contract, the highest card played in the suit led always takes the trick. If an opponent with the lead has a suit headed by all winning cards, that opponent can wind up killing you by playing all those winning cards — be it four, five, six, or seven — taking one trick after another as you watch helplessly. Such is the beauty and the horror of playing a hand at notrump. You see the beauty when your side is peeling off the tricks; you experience the horror when your opponents start peeling them off one by one — sometimes slowly, to torture you. This hand shows you the power of playing in a trump suit. Your trump suit stops the bleeding. On this hand, suppose that you need nine tricks to make your contract of 3NT (NT stands for notrump). Between your hand and the dummy, you can count 11 sure tricks: five spades (after the ♠AK are played and both opponents follow, the opponents have no more spades, so ♠QJ2 are all sure tricks), three diamonds, and three clubs. If you play the hand shown above in notrump, all your sure tricks won’t help you if your opponents have the lead and can race off winning tricks in a suit where you’re weak in both hands, such as hearts. Playing in notrump, West can use the opening lead to win the first five heart tricks by leading the ♥AKQJ2, in that order. To put it mildly, this start isn’t healthy. You need to take nine tricks, meaning you can afford to lose only four, and you’ve already lost the first five. On this hand, you and your partner need to communicate accurately during the bidding to discover which suit (hearts, in this case) is woefully weak in both hands. When you both are weak in the same suit, you need to end the bidding in a trump suit so you can stop the bleeding by eventually trumping if the opponents stubbornly persist in leading your weak suit. Assume that during the bidding, spades becomes the trump suit and you need ten tricks to fulfill your contract. When West begins with ♥AKQ, you can trump the third heart with your ♠2 and take the trick. (You must follow suit if you can, so you can’t trump either of your opponents’ first two hearts.) Instead of losing five heart tricks, you lose only two. Bear in mind that your opponents, the defenders, can also use their trump cards effectively; if they hold no cards in the suit (called a void) that you or the dummy leads, they can trump one of your tricks. Misery. After you have the lead, you want to prevent your opponents from trumping your winning tricks. You don’t want your opponents to exercise the same strategy on you that you used on them! You need to get rid of their trumps before they can hurt you. This move is called drawing trumps.